This itinerary is intended as a guide to help you plan your trip around the British Virgin Islands. It is good to have an outline of where you would like to go and things you would like to see but we do advise you to remain flexible and allow for the unforeseen. When you arrive at our base you will receive a full chart briefing, tailor-made to your trip. We will talk you through all the ‘must-see sites’, things not to miss, obstacles to avoid and we will fill you in on all our personal favourites. We will give you a good idea of which route to take based on your group, the weather and any events taking place, whether you want to join in the action or stay away from the crowds. We will provide you with a ‘Cruising Guide to the Virgin Islands’ and a chart of the local area for use during your trip. If you would like to purchase your own copy of the cruising guide you can do so from CruisingGuides.com. You can also visit OnlineCruisingGuide.com for a free digital version. The Bight at Norman Island makes the perfect anchorage to head for on your first night. After a short reach across the Sir Francis Drake Channel you will sail past The Indians and Pelican Island, straight into the protected anchorage to grab your first overnight mooring. The Bight makes such a good first night stop as it is well protected, has loads of moorings, offers good snorkeling and has a nice restaurant in the left corner called Pirates. Once you are secure on your overnight mooring, jump in the dinghy and make your way over to the Caves. A splendid national park site with natural caves to explore and teeming with sea life to enjoy your first snorkel. Head back to the boat, scrub up and head ashore for dinner. Pirates is a lively, family-oriented beach bar and restaurant. A great place for a casual sit-down dinner and sundowners. Wake up and motor straight over to the Indians. It’s not far enough to worry about putting the sails up. Pick up a National Park mooring buoy and enjoy your breakfast on board. After breakfast, relax a little, enjoy the spectacular rock formations before snorkeling the lavish corals and sponges which contrast with the rocky ledges and steep walls that rise to the surface. Sail to Great Harbor, Peter Island, where the famous Willy T is on anchor. Pick up a mooring for the night and head over for a vibrant party. The Willy-T is the famous floating bar and restaurant and made a name for itself many years ago when they offered a free T-Shirt to anyone who jumped off the top deck naked. Health and Safety stepped in to prevent this ritual but it still has a reputation for being fun and noisy. It’s not for everybody but if you are looking to party and have a good time, this a must do. After breakfast, sail to the wreck of THE RHONE, sunk in 1867, just off of Salt Island for a stunning morning dive or snorkel. Tack up to COOPER ISLAND in the early afternoon and grab your overnight mooring in Manchioneel Bay. Swim over to Cistern Point for more snorkeling or simply relax on the beach or by the bar at the Cooper Island Beach Club. There is a strict ‘no anchoring’ policy in effect at Cooper island, due to the plentiful turtle grass on the bottom. Dine ashore at the restaurant or barbeque on your boat. Get an early start and tack up the Sir Francis Drake Channel to THE BATHS on the southern end of VIRGIN GORDA. Pick up a National Parks mooring and snorkel or dinghy into the beach. Do pay attention to the flag system on the beach if there is a north swell. You can spend the whole day exploring the tunnels, caves and crystal-clear pools through the maze of massive boulders which have been resting here for literally millions of years. Some people call these the eighth wonder of the world! Have a little lunch on board before heading back across the channel towards Marina Cay. You can head ashore for sundowners and a relaxing dinner. Another option is to stay at Scrub Island in the resort’s marina and enjoy their fantastic 2 story pool and restaurants. Off to NORTH SOUND, Virgin Gorda where you will find a little something for everyone. Break up your sail with a stop at the Dogs, a cluster of three small islets, all national parks, with excellent snorkeling and diving. After lunch, head on up into the North Sound, being sure to use the well-marked north entrance and not the shortcut next to Mosquito Island. LEVERICK BAY has a beauty and massage parlor, a little pool, restaurant, beach bar and also a great store to pick up any provisions. – it is well worth it! If weather permits, sail to Anegada early in the morning (leave by 9 AM! ), which is an easy 2-3 hour trip from the North Sound due North. Make sure you called the office first to get the OK! There is only one anchorage and make sure you go in between the red and green entry markers. Take a taxi or rent a car for the day to visit Loblolly Bay, Cows Wreck and Anegada Beach Club. Apart from the beautiful white beaches, you also would like to see the flamingos, rock iguanas and rare plant species like sea lavender. The fantastic outer reef, Horseshoe Reef is rich in marine life and perfect for snorkeling or diving and dotted with shipwrecks. Anegada is the most scenic watersports playground in the region especially for kiteboarders and paddle boarders alike. An for Dinner….? Lobster of course! In the morning sail west, downwind, towards Jost Van Dyke. This will probably be your longest sail and it might be a good idea to stop for a morning snorkel at MONKEY POINT, GUANA ISLAND. Yet another national park, Monkey Point is home to many friendly yellowtail snappers, grunts and jacks, along with turtles and some large tarpon. After lunch, continue to Great Harbor on Jost Van Dyke, home to Foxy’s. Pick up your overnight mooring, then jump in the dinghy and head around the point into White Bay. Enjoy a ‘Painkiller’ at the Soggy Dollar Bar for sunset before heading back round to Great Harbor for dinner. Foxy is well known for his live music and barbeques on the weekends which makes for a great stop for all the family. Today you have a long up wind sail ahead, so leave early. Sail across the channel to BVI Yacht Charters at Joma Marina, Road Town by noon. Give us a call before you arrive to check your docking details and we will have a taxi waiting after you have refueled at our fuel dock and checked the boat out with someone on the dock. When you arrive you will receive a full boat briefing on your boat and a full chart briefing in the office. Our chart briefings take place at 10.30am. For those interested in additional study, NauticEd offer an online chart briefing you can do in advance of your trip. The cost is $13 and it can be done by as many of your crew as you wish. The online chart briefing is NOT a substitute for the full chart briefing on arrival. 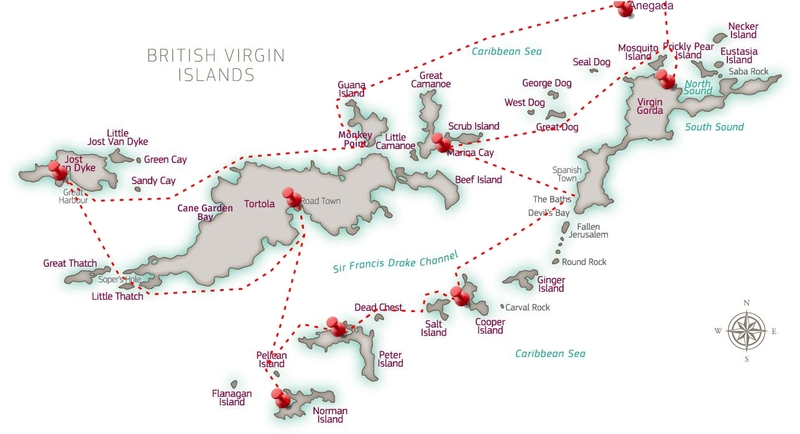 Download the British Virgin Islands Chart Briefing. The T-Shirts says it all. Stunning white sands of White Bay.